I'm hating the wintery weather so these make me feel like comfort food happiness without the calories! I actually do this design quite a lot in different colours, i love it. Firstly, i painted the tip of my nail using a light pink shade. Then, using nail art pens, which you can get pretty much anywhere now but the ones i used you can get by clicking here. I used a darker pink and drew lines over the now dried light pink to create the cupcake case. I then used the white nail art pen to draw an outline of where i wanted my cake to go to and filled that in. I also drew it over the side of the cupcake case to make it look realistic and not just a straight line. Wait for this to dry then simply use a selection of different coloured nail pens to create dots for the 'sprinkles'. I added a little gem stone on the top of my cupcakes while the white polish was still a but tacky but they look fine without too! Then wait for that all to dry and use your favourite top coat to stop any chipping etc! Hope you enjoyed this and i managed to keep it short and simple! Would you try this out on your nails? Well... This just puts my nail post to shame!! haha, i'm sure they don't! these are actually pretty easy with the nail pens! Do try them yourself they're pretty easy! 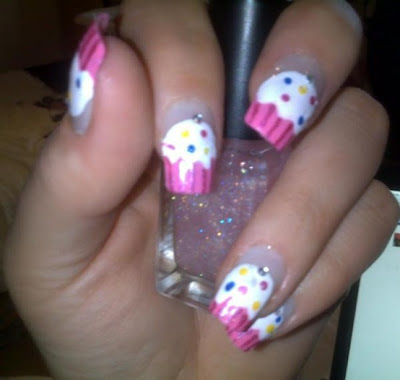 These cupcake nails are so nice :) Going to have to give it a go! Aw i'm glad! Tweet me them @labellavida2 if you do, i'd love to see!